'All About Tranquility' was growing at the UT West Tennessee Research and Education Center in Jackson, Tennessee in a bed maintained by JAIS. Photo shared by Sue Ann Barnes former Region 7 RVP. Below are some of the seedlings I would like to use with the above pod parents. Some have been used and others will be if things ever fall into place. Sometimes Mother Nature steps in and stops your best plans. Buds are frozen back. Pollen isn't fertile. Seed rot. Many things can happen to thwart your plans, but most of the crosses have around a 50 % chance of taking. I've used fall or cycle rebloomers with some of the summer rebloomers. 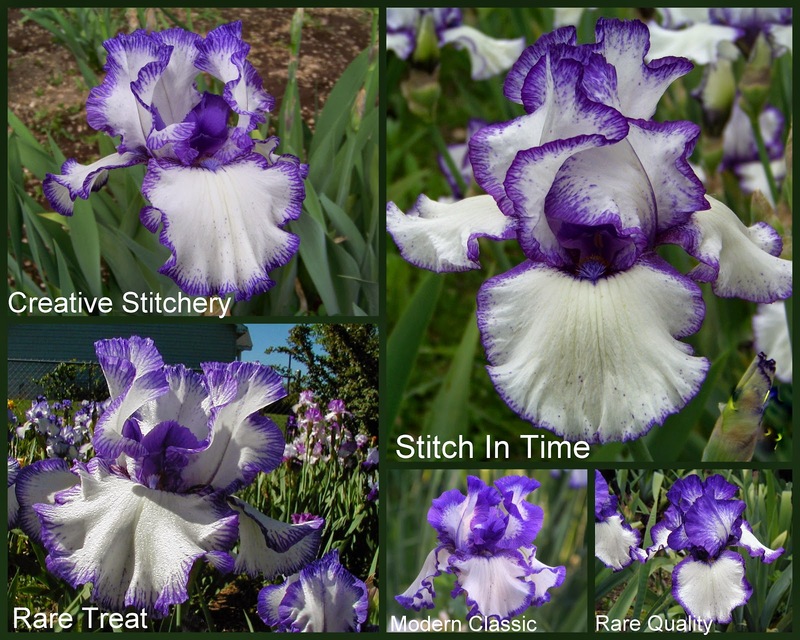 1605-02Re is such a fall rebloomer, and these are the irises represented: 0915-01:(((Victoria Falls x Vanity) x Immortality) x Love Lines) X 1025-03 (Feed Back x Champagne Elegance). '2410'contained several tall seedlings with a variety of colors, white, purple, and bitone blue. 1624-01re ('Sweet Addiction) is ('Star Gate' x ('Bridge In Time' x ('Feed Back' x 'Titan's Glory))) X 2019-05 (Lunar Whitewash x Romantic Evening). Both seedlings used in this cross were white. This seedling is the strongest rebloomer from 1907 ('Blatant' x 'All Revved Up'). This cross produced several rebloomers, two summer bloomed. 'Cool Character' was introduced from this cross. Rebloom breeding is more difficult than trying to improve a color or pattern. On the plus side, you are already dealing with strong, healthy plants. Always a good thing. What would you use with these in an attempt to create good rebloom in the inner continental areas? 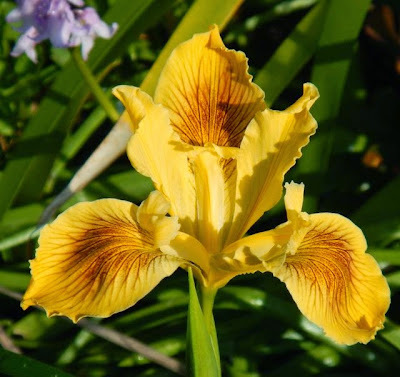 Starting with yellow flowers, one of the most common colors in wild Pacific Iris populations, I will work through the color spectrum in coming months, though not in strict rainbow order! Ken Walker, SPCNI's photo archivist, gave a talk on this topic at AIS's 2012 Convention in Ontario, CA. I will include photos from that talk when I get to some colors and patterns. Species of all colors tend to narrow petals with a few veins, a small signal, and no to limited ruffling. Hybrids developed with broader falls, more ruffled edges, larger style arms and standards, and with a dizzying array of veining patterns, larger signals, multiple colors in the signals, and slashes down the center of the falls. So, beginning with yellow, I start with the Golden Iris. Iris innominata in a garden setting, this one has fairly narrow petals and brown veins on the falls. Iris innominata, Golden Iris, is one of the gorgeous species in the Pacifica group. [OK, there are no non-gorgeous PCIs, some are simply gaudier than others.] In the wild, I. innominata petal color varies from white through pale yellow to dark gold and almost orange. Veining varies from almost none to orange, red, dark red or brown. Wild petal width varies from very narrow to moderately wide and slightly ruffled. Wild plants are small, usually well under one foot (25 cm) in height. Flowers are usually held above the foliage. Foliage is dark green, and evergreen. This is a very attractive garden plant even as a wild species. Unregistered PCI Burnt Sugar is a slightly huskier innominata-type with a more complex signal, dark red veins, and larger leaves and flowers. Yellow flowers are also seen in wild populations of I. chrysophylla, I. douglasiana, I. tenax and in natural hybrids. 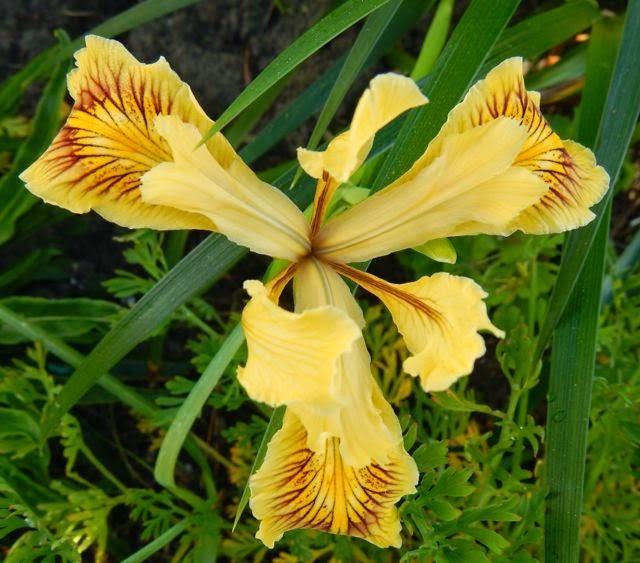 Garden-selected plants that range from pale yellow to dark yellow have been developed in the past century, with the brakes off on veining, ruffling, signal size and color, and other traits. PCI 'Garden Delight' is a lighter yellow with even more complex signal and veins on falls. Flower stalks tend to flop over, however, so it's best grown with other plants to provide support. As breeders worked on yellows, petals got larger, wider, and more ruffled, and signals and veining patterns increased in complexity. PCI 'Sierra Amarillo' is darker yellow than 'Garden Delight', and is also floppy in the flower bed. The flowers are delightful, however, and worth growing with other plants to hold them up. Some new seedlings from tall-yellow seed from Joe Ghio include the following flower, which is still being evaluated in my garden. 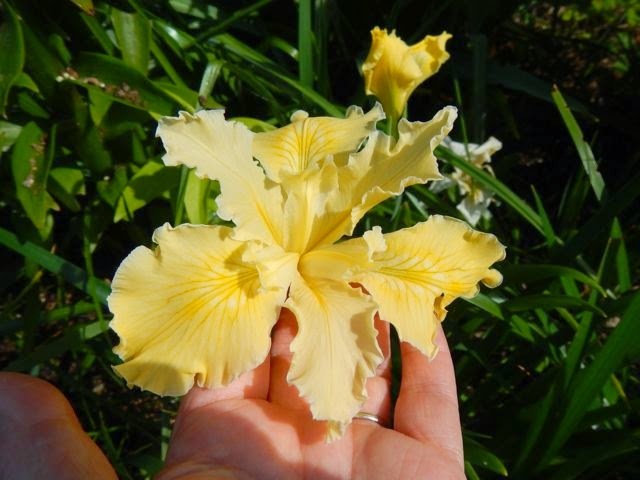 This Ghio-sourced seedling has more ruffles and delivers a nice blast of light yellow. 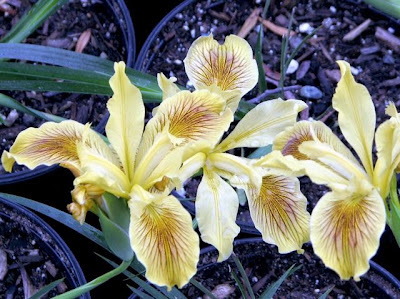 Other new hybrids include one seen here before, an unregistered yellow Pacifica Iris that delivers floral complexity on a sturdy plant, with nicely upright flowers, not too ruffly. It even holds up in the rain fairly well. This pale yellow PCI has a complex signal with multicolored veins and a hint of blue on the falls; see this on the right hand flower in particular. Flowers are slightly ruffled, but not solid 'dinner-plates' of overlapping petals. No name yet––I'm pondering Golden Dawn, or Golden Twilight. It's nicely upright in flower. I return to judging guidelines regularly to remind myself that good Iris flowers have to hold up in weather, and be strong plants, not simply have beautiful flowers. Garry Knipe and I talked a couple of years ago about a sturdy yellow PCI that would flower in early spring with the daffodils. I can't wait to see this one! As promised, here is part two of my favorite purples. To see the first part, click here. As you know, I love the color purple. 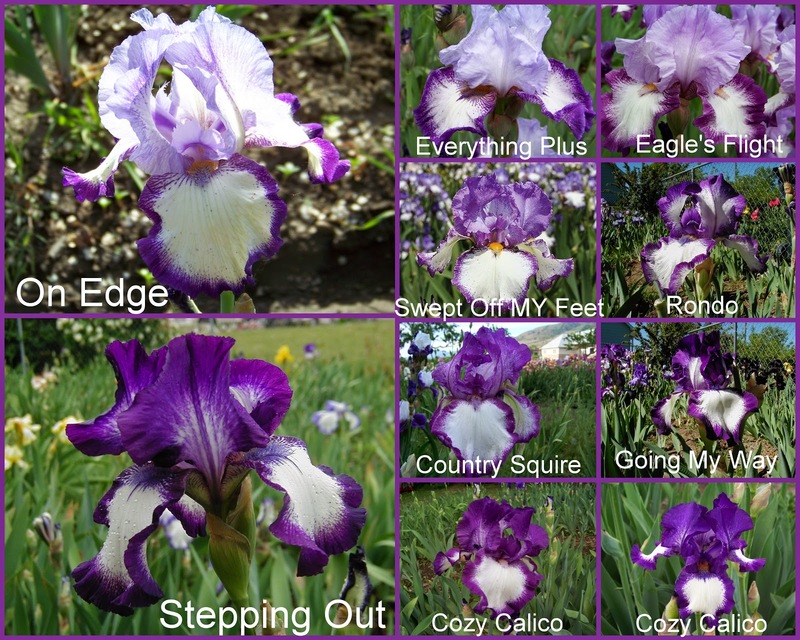 Here are some more purple irises that I recommend for your gardens. 'Splashacata' (Tasco 1998) This won the Dykes Medal in 2005. This is a nice iris in every way. This purple must be listed in the favorites category: ‘Dusky Challenger’ (Schreiner 1986). 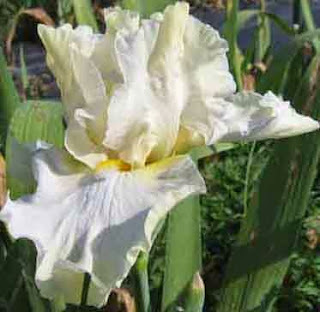 It has been in the top 25 on the Iris Society's popularity poll ever since it was introduced. It won the Dykes Medal in 1992, and with good reason. It is huge, well formed, with very strong substance and luxurious thick beards. I find no fault with it. Another one that keeps popping up on everyone’s favorite list is ‘Jesse’s Song’ (Williamson 1983). This ‘Historic’ (30 years old or older) is a great performer. 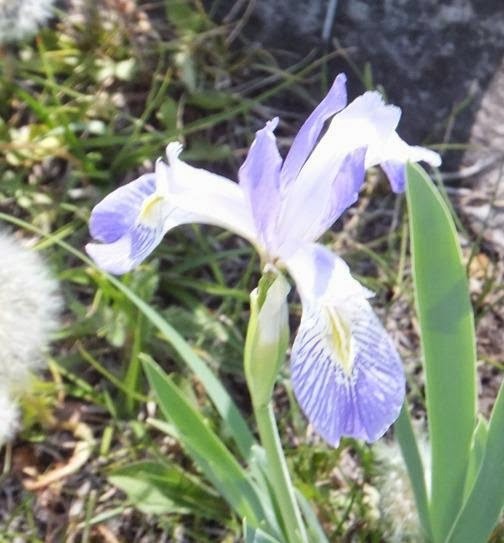 It is usually one of our first irises to bloom in May and also one of the last to finish some time in June. It has masses and masses of blooms in between. ‘Aristocracy’ (Keppel 2006) is a great addition to any garden. Photograph courtesy of Susanne Spicker, taken in our garden. ‘Gitano’ (Keppel 2007) A striking blend of two colors that I normally wouldn’t think would look good together, but they do. I have severe allergies and can't be outside for long periods because of all the trees and weed pollen (and we have an orchard with about 400 trees). I AM NOT ALLERGIC TO IRISES, THANK GOODNESS. I like to make arrangements so I can live with the iris that I love so much. I especially like arrangements with various shades of purple and yellow together. Because those colors are opposites on the color wheel or complimentary colors. they make each other look more intense. In this vase I have ‘Aristocracy’, ‘Dusky Challenger’, ‘Glowing Smile’, 'Bicentennial’, ‘Conjuration’ , and either 'Silverado, Silver Years, or "Sterling Silver' (I can't remember which). You know how some diets encourage you to write down everything you eat? You find you have been eating more than you realize. Until now, I didn't realize how many purple plicatas I have, and this isn't all of them either. I should probably restrict myself from buying more plicatas, but , like a diet, that's no fun! Pictured: ‘On Edge’ (Schreiner 1986), ‘Everything Plus’ (Niswonger 1984), ‘Eagle’s Flight’ (Schreiner 1986), ‘Swept Off My Feet’ (Schreiner 2014) photo courtesy of Schreiners, ‘Rondo’ (Schreiner 1973), ‘Stepping Out’ (Schreiner 1964), ‘Country Squire’ (Gaulter 1966), ‘Going My Way’, and ‘Cozy Calico’ (Schreiner 1980). I love all of these with their minor differences. I also have a smaller section of purple plicatas that are more blue and less rose, below. ‘Creative Stitchery’, (Schreiner 1984), ‘Stitch In Time’ (Schreiner 1978), ‘Rare Treat’ (Schreiner 1987), ‘Modern Classic’ (Knocke 1975), ‘Rare Quality’ (Schreiner 1987) I have had 'Creative Stitchery' and 'Stitch In Time' almost since they were introduced. They feel almost like family. 'Starwoman' IB (Marky Smith 1997) I only have 3 IBs and this made the cut. It won the American Dykes Medal in 2008. 'Daughter Of Stars' (Donald Spoon 2000). This luminata is just breathtaking. "your love of iris comes thru strong and clear. I love your pictures of each and the interesting little tidbits on each...like each one is a close and personal friend of yours." I have been thinking about how true that statement is. Some of them are "like family", and like my children, I worry about their safety. I'm always so relieved when they make it through another winter and come to see me. They are starting to bloom now so excuse me, I need to go see who has made it through another winter. I love to read your comments so please tell me what you think. I became interested in irises as teenager. 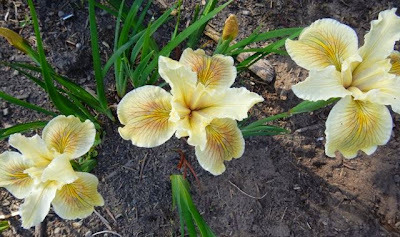 After a year or so of growing tall bearded irises, I became more aware of the other types available, and of the special groups of enthusiasts who had gathered around each type. When I discovered that there was a group (SIGNA) just for “species iris”, I was baffled. In my biology classes at school, I had learned that the species was the basic category for classifying all life on earth. So didn’t all irises belong to some species or other? It didn’t make sense that there would be a special iris society just for species. Beginning classes in school, naturally, emphasize simplified basic concepts at the expense of all the qualifications, complications, and exceptions that the real world has to offer. In school I learned that two individual animals or plants belong to the same species if they can breed and produce fertile offspring. But that’s not always the case, especially in the plant kingdom. Irises belonging to two different species can often cross and produce fertile offspring, and in fact this is how most of our named garden varieties of iris originated. Those named varieties (“cultivar” is the precise term) are almost all hybrids, with two (or more, usually) different species in their ancestry. So now it started to make sense. 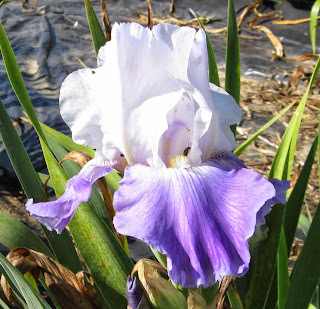 People interested in “species irises” were interested in the original iris species that exist in nature, as opposed to the many garden cultivars that had been produced by hybridizing, crossing different species with one another. 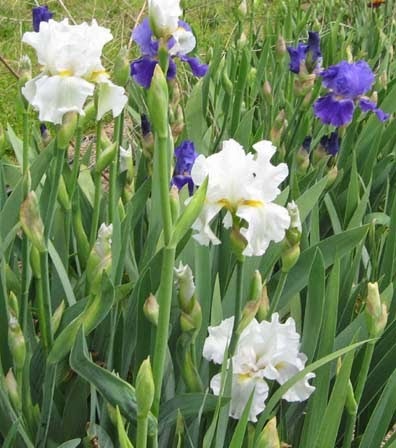 I grow bearded and aril iris species, because I’m interested in hybridizing with them, and also because they come from parts of the world with climate similar to my own, so it seems a good fit. 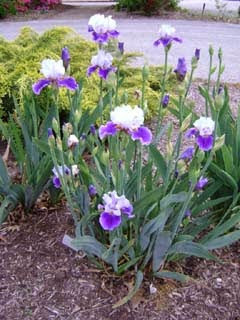 Many people grow other kinds of species: Siberians, Louisianas, and wild irises from North America, Europe, and Asia. 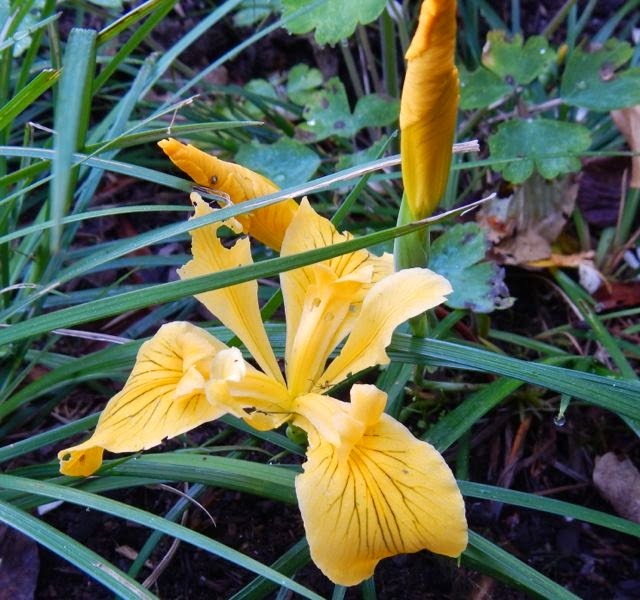 What is the appeal of species irises for gardeners? Obviously, botanists are scientifically interested in the original species, which are the product of natural evolution and occupy distinct ecological niches. 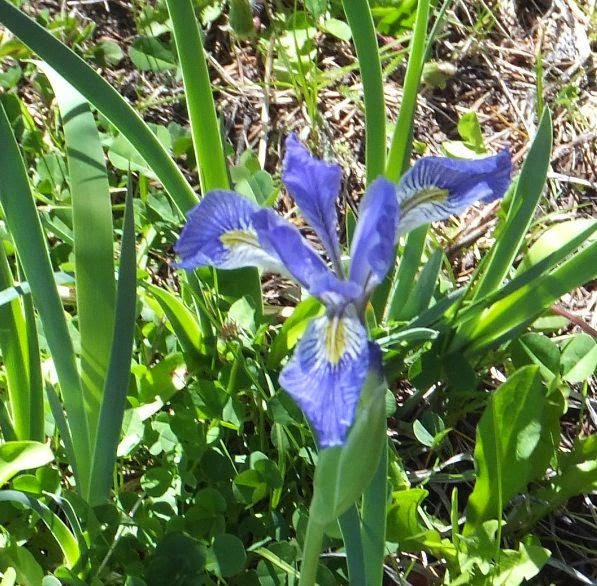 For a gardener or iris hobbyist, this scientific curiosity can inspire interest in the wild species. But there are other lures as well. There are many species that have been used infrequently or not at all in hybridizing. If you take a fancy to these, you will necessarily be growing species. Some of us like the “wild look” as an alternative to the deliberately “altered” creations of human hybridizers. 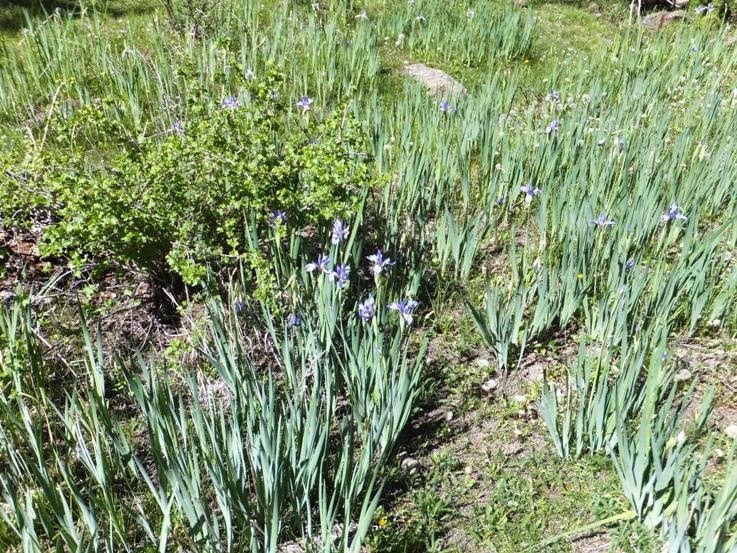 And some like the idea of growing the wild irises native to their own area. For others, conversely, species from other parts of the world provide a connection with the plant life of distant lands and environments. If you take an interest in species irises, you soon learn an important difference between species and hybrid cultivars. The hybrid cultivars are all propagated by division. Each plant is an identical replica of the original. Each one is really an individual organism, as distinct from all other irises as you or I are from all other people. But a species is not an individual. A species is an entire population of related individuals; it is like the whole of Homo sapiens from all the places humans live, with all their different characteristics and genetic heritage. 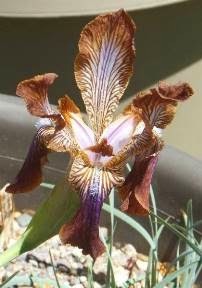 So whereas I can “have” a particular cultivar, say ‘Dividing Line’, in my garden, I cannot “have” a species, such as Iris pumila. I can only have at most a few individual plants that belong to that species. They will all be different individuals, and all different from the great numbers of other Iris pumila plants growing wild in Eastern Europe. Species enthusiasts embrace this fact, and often strive to have a range of different plants representing each of the species they grow. This not only adds interest to the collection, but helps preserve some of the genetic diversity of the species in our gardens. 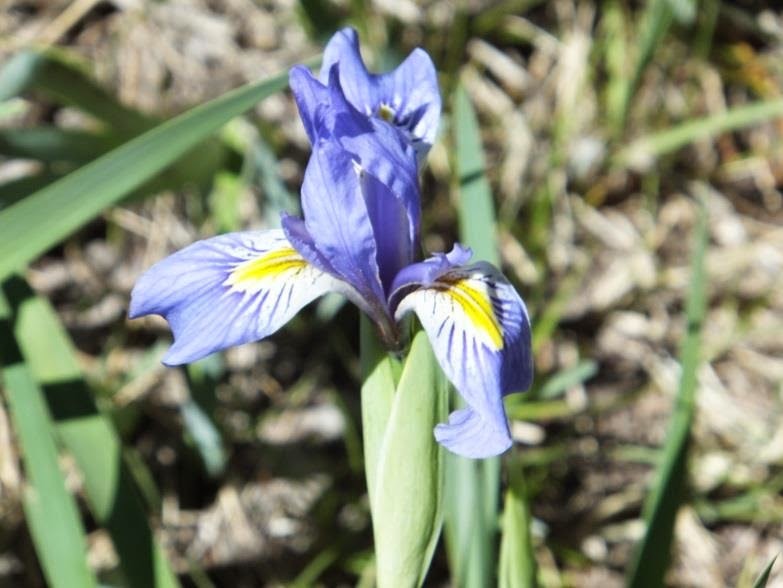 Like many wild plants, irises are often threatened in their native environment by human activity and encroachment. The gardener who grows species contributes, in a small but potentially significant way, to their conservation and preservation. For those of us interested in hybridizing, growing many different plants of the same species offers another benefit: genetic diversity. If you trace the ancestry of our garden hybrids back far enough, you will find the same ancestors appearing over and over again. Despite all the range of color and form in the modern hybrids, they actually come from a rather inbred gene pool. Going back to the species expands the genetic base for our hybridizing efforts. This brings me to a final observation. One can obtain species plants from commercial sources and others who grow them, including named cultivars in some cases (these are selected individuals of the species, not hybrids between different species). But it can be even more satisfying to raise species from seed. Many iris societies and rock garden societies have seed exchanges, where one can inexpensively obtain seed of many different iris species, including sometimes seed collected in the wild. There are also some commercial sources, mostly specialist plant collectors. 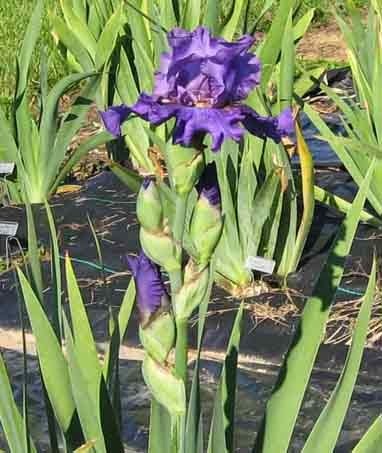 When you raise irises from seed, you will naturally be “selecting” those plants with the genetic predisposition to do well in your own climate. Growing species irises, particularly growing them from seed, provides a window onto the natural world that growing only hybrid cultivars cannot. There is a special pleasure that comes from raising these lovely wildflowers, knowing that you are enjoying (and helping preserve) some of the world’s beautiful and fascinating flora.